“Mr. Nakao spent the first 27 years of his career working for the Toyota Group where he was mentored and trained by Mr. Ohno, originator of the Toyota Production System (TPS). Mr. Nakao was a part of the original autonomous study groups initiated by Ohno who ultimately came up the basic philosophy and approach of TPS. Mr. Nakao founded the Shingijutsu Company in 1987 at the behest of Mr. Ohno. While I have participated in a number of Shingijutsu kaizens as a team member or team leader, this was the first time that I was able shadow and observe the sensei for five days of kaizen. As a team member or team leader, you meet with the sensei for perhaps a total of 60-90 minutes per day. I was able to spend all day with sensei, every day, including dinners and my duty as sensei’s driver. He spoke a lot, which means I learned a lot. And, I will learn more in the future as I learn what I learned. What I learned from Mr. Nakao about kaizen, processes, people, respect, creativity, innovation, motivation, and business is almost indescribable. Mr. Nakao is an amazing sensei – the best there is. He is also a generous man, happy to share his profound knowledge with all whom he comes into contact with. I took copious notes and hundreds of photos. I have a good understanding of kaizen based on years of practice and reflection. But, seeing Mr. Nakao lead kaizen and spending all that time listening to him has greatly deepened my understanding of kaizen. Mr. Nakao things in ways that very few people do and says things that nobody else says. The depth and breadth of his knowledge and insight is astounding. This informs an approach to kaizen that is unlike anyone else. Indeed, it is THE approach to kaizen. Why? Because it is passed directly from Mr. Ohno to Mr. Nakao, inclusive of Mr. Nakao’s dedicated efforts to build upon what he learned. This lineage matters. People complain that kaizen often fails or yields disappointing results. This is because not all kaizen is the same. Firstly, I am certain there is a problem with the method used. Bad process yields bad results. Second, the success of kaizen – the number and magnitude of actual improvements made and resulting learning – depends a lot of on the facilitator. So, kaizen is a combination of method and human (facilitator) capability. In most cases one is missing, often it is both. Kaizen does not fail or yield disappointing results when both method and capability are strong. Unfortunately, there are far more people whose understanding and practice of the method and their capabilities are weak rather than strong. Many people say they have been trained by Shingijutsu to strengthen their standing as kaizen consultants. While training is necessary, it is not sufficient. One must have also learned from Shingijutsu. The former is method while the latter is the development of human capability. And don’t forget, there is no Lean without kaizen. Kaizen is how you learn Lean management. Therefore, the facilitator’s method and capabilities must be strong. 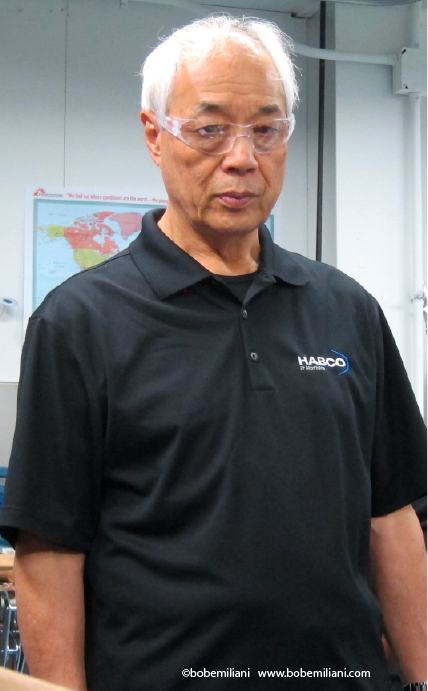 Mr. Nakao’s kaizen method and capabilities are the target condition that kaizen facilitators must work towards. If they do not, then kaizen is practiced incorrectly and is ineffective. Thanks for sharing this and for your tweets. I’m curious if Mr. Nakao talked to the team about ongoing Kaizen. A Kaizen Event, of course, is just one way to drive improvement. What were the expectations for what happens beyond the event? Will they continue improving? Will Kaizen be part of their daily culture? He noted that some of the improvements made were world class, and used them as examples of good creative and innovative thinking (produced largely as a result of Mr. Nakao’s many “nos” – no money, no new equipment, etc.). Additionally, I suggested to management several ways to make greater use of Mr. Nakao’s visit and his teachings to develop a kaizen culture more quickly. In 2000, I had the honor and pleasure to meet Mr. Nakao, at Brazilian Mercedes-Benz 5 day Kaizen. In that time I did not know who was this great man. After reading “Lean Thinking”, I noticed who he was. I have heard stories of Mr. Nakao for many years but this is the first piece that gives me a sense of how he spreads his gems. This was great reading Bob. Thank you for sharing a real and personal account of your learning from/with such a master. I was wondering how Mr. Nakao approaches the kaizen strategy development. Does he make a pretty clear game plan as part of the kaizen preparation or work with the groups to develop the strategy for their learning. I imagine the answer could be fairly deep but I would appreciate anything you can share. Hi Lesa – I’m glad you liked the blog post on about Mr. Nakao. It’s really quite straightforward. Mr. Nakao has a clear, general plan for kaizen. But it is the client who identifies 5-6 important problems that affect cost, delivery, or quality (usually all three at once), and which therefore are problems in need of improvement. This then forms the basis for teaching kaizen team members how to improve processes. The learning that team members experience then can be applied anytime to make other improvements. Shingijutsu was founded by Yoshiki Iwata. Iwata and Nakao worked together in the T.A.S.G. under Taiichi Ohno. Nakao started making this claim when Iwata passed away in 2001… and, sadly, it just isn’t true… This fact has no ramifications where his techniques are concerned, but credit should be given where due. Again, you’ve written a great piece and were surely unaware of this discrepancy; I just think it’s a shame for Iwata’s memory go unhonored. Should someone wish to, they can still work with those who carry-on the original founder’s vision at Shingijutsu Global Consulting. (“Global” being the key word.) This entity was retained by Iwata’s children, and majority of Shingijutsu’s consultants, when Nakao split away from the original company in 2003. Steps are being taken to stop Nakao from making the claim, but regardless, both companies carrying the “Shingijutsu” name are the best of the best; though philosophies differ, the methodology is nearly the same and it’s an honor to work with either! Hi Mike – I don’t recall Nakao-san ever making the claim you say he makes to me or anyone else. The word “Shingijutsu” was linked to Shingijutsu USAs web site. I made a correction to say “co-founded” to avoid confusion with Shingijutsu Global. Shingijutsu Co. Ltd. web site ca. 2001 says “Shingijutsu Co. was founded by Yoshiki Iwata, Chihiro Nakao and Akira Takenaka in 1987…” So Iwata-san was a co-founder, not founder. As you note, both Shingijutsu organizations share a great heritage. I remember Iwata-san at Pratt and Whitney years ago. His untimely passing was a great loss. Thank you, Bob! To be fair, “claim” may not have been the best word choice; it was to the bio posted on Shingijutsu USA’s website I was referring. I have, however, seen the misunderstanding crop-up elsewhere from time-to-time. One of Nakao-san’s ‘No’ is No “M” Machine. Can i know what is “M” means? Hello SH – Thank you for buying the book. Most of the machine-makers’ name begins with an M. So Mr. Nakao is saying, generally, don’t buy expensive machines that are over-designed for your actual need (and hence, more expensive that necessary). Buy only the parts of the machine that you actually need. Or, better yet, make the machine yourself, if possible, to perform only the needed function, and to develop valuable engineering expertise and to reduce capital equipment and operating costs.